Is There a Real Jurassic World? Universal Parks. Used with permission. So, you saw dinosaurs wreaking havoc in the Jurassic World movies at your local cineplex (or streaming on your TV or device), and it got you wondering, "Is any of this real? And if it is, where can I see raptors get all pre-hysterical in person?" The short answer is that you can see lumbering dinosaurs without donning 3-D glasses, enduring sticky theater floors, or falling asleep on your living room couch. As for the "real" part? Well, let us break it down for you. There may not be any living dinosaurs or other prehistoric creatures on the loose, but the 2015 film did use an abandoned Six Flags park for some of its location shoots. Six Flags New Orleans, which was previously known as Jazzland, served as a stand-in for Jurassic World. Hurricane Katrina destroyed the park, and it never reopened. The defunct park has served as the setting for other films as well. In addition to the Louisiana location, several spots in Hawaii (which also was used for the original film in the series, Jurassic Park) stood in for the fictional island of Isla Nublar off the coast of Central America. There are places that reproduce, theme park-style, the experience of visiting Jurassic World without any of the carnage. 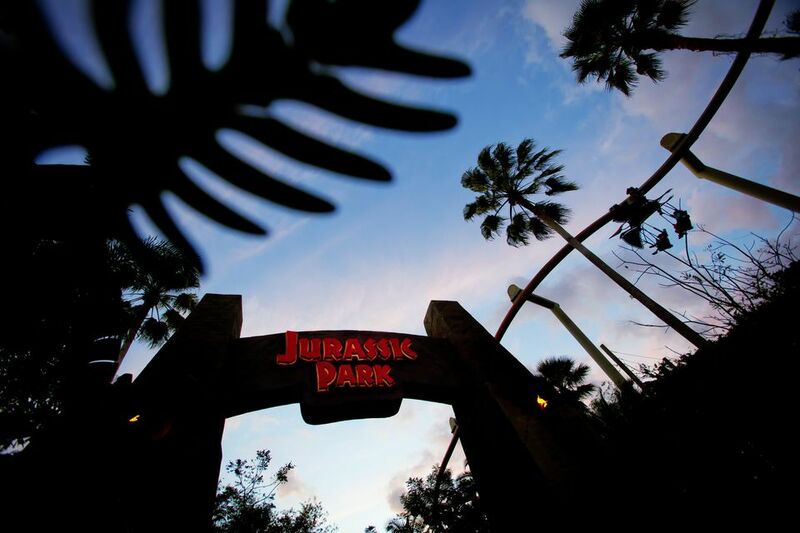 Based on the original movie directed by Steven Spielberg and released in 1993 (conveniently enough by Universal Pictures), Islands of Adventure at Universal Orlando includes a Jurassic Park land. You can walk through torch-adorned gates at either end of the "island" and hear the majestic John Williams theme music. The landscaping is note-perfect. The featured attraction is Jurassic Park River Adventure. Instead of Jeeps or see-through gyrospheres, passengers pile into boats to take a tour of the prehistoric beasts in their habitats. It starts off innocently enough with gentle dinos. But like the movies (and most story-based theme park rides)—SPOILER ALERT!—things go horribly wrong. After nearly getting swallowed by a mean-looking T-rex, the boats take an 85-foot dive down a dark, steep hill (one of the longest plunges for a shoot-the-chutes park ride) and make an enormous splash at the bottom. The Florida land also includes the Jurassic Park Discovery Center, which evokes the main building from Spielberg’s film. It includes a replica T-rex fossil, a "nursery" with "dinosaur eggs" that "actually" hatch, and other exhibits. The Pteranodon Flyers is a fairly gentle, suspended roller coaster. It has very limited capacity and notoriously long lines. The Flyers soar over Camp Jurassic, a well-appointed, dino-themed play area for younger kids. Dining in Jurassic Park includes Thunder Falls Terrace, a quick-service restaurant which offers decent rotisserie chicken, BBQ ribs, and other items, and The Burger Digs, which has beef burgers and garden burgers on its menu (but, alas, not brontosaurus burgers). In summer 2016, Islands of Adventure opened Skull Island Reign of Kong in Jurassic Park. While it deviates from the dinosaur movies and focuses on Universal's famous ape, the prehistoric animals are prominently featured in the attraction. Universal Studios Hollywood featured Jurassic Park - The Ride, which was more or less the same as Florida's boat-based River Adventure. It closed in 2018, however, and will reopen in 2019 as a Jurassic World-themed ride. The Hollywood park also offers a Jurassic Cafe with a patio dining area that overlooks the ride. But the more compact Universal Studios in California does not have any of the other Jurassic Park attractions found at Islands of Adventure. There is a similar Jurassic Park boat ride at Universal Studios Japan. In 2016, the Osaka park introduced The Flying Dinosaur, a high-thrills, flying-style coaster that allows riders to soar in a nearly prone position like a Pteranodon. Universal Studios Singapore has a Jurassic Park Lost World, which features Jurassic Park Rapids Adventure, an attraction that substitutes whitewater circular rafts for boats. It also includes a Canopy Flyer inverted roller coaster and a Dino-Soarin' spinning ride. The Chinese company, Wanda, has plans to build a multi-billion dollar, Disney-style theme park in Australia by 2020. It struck a deal with Legendary Entertainment, which owns the intellectual property rights to Jurassic World, to develop attractions based on its titles (which also include Godzilla and The Dark Knight). It's likely that full-sized animatronic dinosaurs will roam a Jurassic World-like land in the new park.